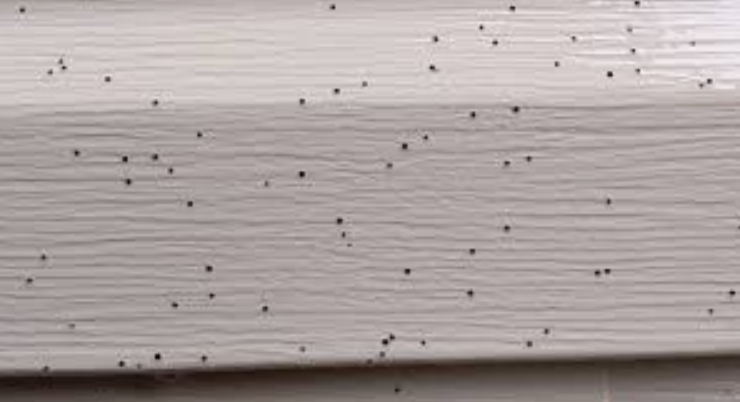 Commonly referred to as "black specks" on siding,..it is also often thought to be fly dirt or spider dirt or bug dirt in general. But it is not any of those things. Below the picture is a question and answer section that may help you understand what it is and what can be done to prevent it. I highlighted in red the question and answer that most pertains to the aesthetics part of the problem. These are typical, frequently asked questions (FAQ) that I normally field during the spring and summer (very seldom in the winter) -- along with a brief summary of typical answers. Answers are meant to be (hopefully) informative, not very technical, and are not meant to offer concrete solutions. The questions are generally in the order that they are asked. Q1: We have these small black spots that look like specks of tar, all over our white, vinyl siding of our house. It's on the porch, my windows, but it is worse on the siding. It goes all the way up to my second-story windows, and is even under my soffitt and on my gutters. What do you think it is? A: Sound like you have the infamous "artillery fungus". 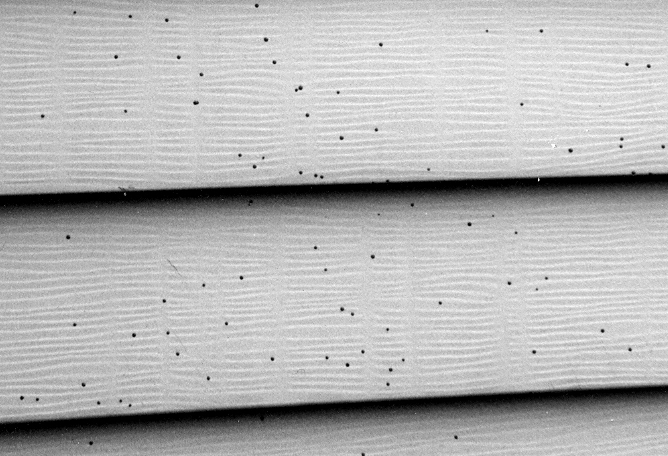 Click here link to see what the spores of the artillery fungus look like on house siding. Q2: I think I have seen some spots on my car. Does the artillery fungus also get on cars? A: Yes, this is common on the sides of automobiles when cars are parked near mulched areas that are infested with the artillery fungus. It is especially noticeable on white sports cars – at least these are the owners that complain the most. In fact, we have had complaints where private companies have artillery spores on 50-100 cars in their parking lots. The next question asked is, "How do we remove the spots from the sides of cars?" We do not know, but some suggestions have included: power washing if the artillery fungus spots are very new and paint/wax on the cars is also new and shiny; automotive-paint rubbing compounds; and removal (if there are only a few spots) with the edge of a credit card. However, you must be very careful not to damage the car's finish. See some car owners' attempts at removing the spots from cars at the end of this section. These are NOT recommendations!!! Q3: Does the artillery fungus hurt pets? Q4: So, what exactly is the artillery fungus? Q5: I cannot see artillery fungus in the mulch – just how big is it? Is it the same as those little cups called the "bird’s nest fungus"? A: The artillery fungus is quite small – the fruiting bodies are about 1/10 of an inch across and are very hard to see in the mulch. Artillery fungi are much smaller than the "bird’s nest fungus" (link) with which may be mistaken. By the way, the bird’s nest fungus does not actively shoot its spores – those little “eggs” of the bird’s nest fungus are splashed out by raindrops, and thus are called "splash cups." Q6: Why is it called the "artillery" fungus? Is it also called the "shotgun fungus"? A: The term artillery refers to the fact that the artillery fungus actively (uses energy) shoots its spore masses, sort of like a cannon or howitzer (an artillery piece). We will call these “spores,” although they are technically spore masses, or gleba. The spores are usually shot only a short distance but the wind can carry them for longer distances and even up to the second story of a house. The term "shotgun fungus" usually refers to Pilobolus (see the Utah University (link)), a different kind of fungus that commonly grows on fresh horse dung. Q7: Why do light-colored houses and cars have more problems than darker cars and houses? A: In nature, the artillery fungus shoots its spores towards sunlight to aid in dispersal. In the absence of direct sunlight, it shoots the spores at highly reflective surfaces, such as white house siding. And, of course, the black spots show up better on white surfaces, so they are noticed more easily. Q8: The artillery fungus problem seems to be much more severe now, than in the good old days. I don’t remember this being a problem 20 - 25 years ago. Why is it now a problem? A: This is a tough question. Wider recognition and awareness of the artillery fungus by the public certainly has led to a perceived increase in the problem. However, I think the problem is also realistically more severe than in past years, partly due to increased use of landscape mulch. There is more mulch being used these days, and therefore, more favorable material for the artillery fungus in our urban and suburban areas. The artillery fungus may be just as common out in mulched flower beds far away from your house, but it is not noticed at that location. But, put the same mulch (and artillery fungus) next to your house foundation, add a white or reflective siding, and you may have a severe problem! In addition, it is my experience that the artillery fungus seems to prefer wood as opposed to bark. Much of the mulch that we use today is recycled wood – in the past, most mulch was bark. In addition, the finely-shredded mulches used today hold more moisture than the older coarsely ground mulches – this favors fungi, because they need moisture to survive and sporulate. Q9: Why is this problem more severe in some years than in others? A: The artillery fungus grows better and produces more spores during wet years. It is also most common during the cool spring and fall, and is much less of a problem in the hot dry periods of mid-summer. And, it is not a problem during the winter here in Pennsylvania. Q10: The number of spots seems to be worse on the north side of my house. Is this just my imagination? A: It is not your imagination, and you are a good observer. The artillery fungus often grows better in the mulch on the cool, shady, moist side of the house (usually the north side of the house here in the Northeast) where growing conditions (cool and moist) are more suitable for the fungus. Q11: Are those spots alive? Will they hurt my house, like eat holes in my siding? Q12: So, how do I get the artillery fungus off my house siding? Will any cleaning chemicals remove it? Power washing? How about just plain scraping? Do the spores stick to all kinds of siding? A: The spore masses of the artillery fungus stick like super-glue. We have not found an efficient way to get them off without leaving a stain on the siding, especially on old dry siding. Power washing may work on brand new (only) vinyl siding that still has a shiny, oily, sheen. However, even power washing usually fails. Each spore mass can be physically scraped, "steel-wooled", or sanded off. Then the stain might be removed with an ink eraser, but this is a pain, literally. Beware of any cleansers that have claims that sound "too good to be true", with regards to removing the artillery fungus. It is likely that they are, in fact, too good to be true. At the end of this section I have listed some attempts that readers have used to remove artillery fungus. Q13: How did the artillery fungus get in my mulch? My neighbors do not have it – only me! Why me! A: This is extremely difficult to answer. The artillery fungus commonly occurs on dead trees, dead branches, rotting wood, etc. throughout the Northeast. I have seen it in the forest on standing dead trees and limbs on the ground, as well on wood in mulch-producing yards. If infested material is used for mulch, the artillery fungus may be already in the mulch when the load of mulch arrives at a job site, and may then grow rapidly along your foundation during cool moist conditions. However, this may be more of a problem when mulch is not composted, which subjects the mulch to higher internal temperatures, which may inhibit artillery fungi. Or spore masses may already be present at a site on old mulch, previously infested plant leaves, rabbit or deer droppings, decaying leaves, and grass. These existing spores may immediately infest new applications of mulch. Remember nature "abhors a vacum." In some cases, the spores also may be transported for very short distances via wind from adjacent infested sources. Spores may also be brought to the site on infested nursery plants, by being stuck to the undersurface of leaves, if the nursery also had an artillery fungus problem. When the leaves fall off onto the mulch… here we go again! People can also spread the artillery fungus in various ways. Some homeowners make the mistake of sanding, scraping, or otherwise removing the spore masses from the sides of their houses, and letting them fall onto their foundation mulch. Such spores are dormant, but very much alive. Under moist conditions, they germinate and reinfest the mulch. Q14: You mean that the artillery fungus can come in on plants and shrubbery that I purchased and have planted along my foundation? Q15: In your studies, have you found any wood/bark mulches that the artillery fungus absolutely will NOT grow on? Q16: So what mulch(es) appear to be best? A: We tested 27 mulches in the field, and found that some supported more artillery fungus than others. In one study, the most resistant mulch was large pine bark nuggets. The large bark nuggets often stay hard and dry, conditions that the artillery fungus does not like. Cypress mulch also performed fairly well, as it probably contains some anti-fungal, anti-decay chemical(s). However, there may be some environmental, non-sustainable reasons for not using cypress. Click here (full text) for an article from the Journal of Environmental Horticulture entitled "Artillery Fungus Sporulation on 27 Different Mulches - A Field Study"
Q17: I have heard that used "mushroom compost" will suppress the artillery fungus. Will it? A: Used mushroom compost, also known as "mushroom soil," "spent mushroom substrate (SMS)," and even "black gold" is a great product, if you live in an area where you can get it,especially for free. Mushroom compost has many beneficial aspects for gardeners, one which is that it supports micro-organisms that inhibit unwanted pest fungi. Mushroom compost is pasteurized before it is used to grow mushrooms, and then the used compost is pasteurized again when it leaves the mushroom house, so it should not contain weed seeds. Our research at Penn State has shown that blending used mushroom compost with a landscape mulch at about 40% by volume (add 4 buckets of mushroom compost to 6 buckets of landscape mulch) will greatly suppress artillery fungus sporulation. Used mushroom compost is very "green" and environmentally friendly. Click here (full text) for an article from the Journal of Environmental Horticulture entitled "Use of Mushroom Compost to Suppress Artillery Fungus." Q18: How about artificially colored mulches? A: We have tested mulches of various colors, as well as the chemicals themselves that are used to color the mulches. The coloring agents in our tests, at the concentrations used, did not significantly inhibit the artillery fungus. But colored mulches appeared to very slightly, but only temporarily, inhibit the artillery fungus. We attribute this to the colored mulches being slightly more water repellent and therefore drier than the non-colored mulches, at least at first. As the colors faded due to rain and sunlight, the artillery fungus moved right in. However an ideal situation for a mulch producer might involve mixing legally registered fungicides in with the coloring agent. But, this is for the future. Q19: Should I put down new mulch each year? A: Interestingly, homeowners that put down a new layer of mulch each year generally have less artillery fungus problems. But, we have not confirmed this practice. But it does seem to work, if you don't miss a year! Q20: How about composted mulch? Is it better or worse? Q22: Are there any registered fungicides that will kill the artillery fungus? Q23: I cannot get those black spores off my siding, without leaving a lot of small brown stains. My siding is ruined. Will my homeowner’s insurance pay for residing my house? A: Some insurance companies will and others won’t. It depends on your insurance company, your agent, the exemptions in your policy, and especially your lawyer. Q24: I just checked my policy. My homeowner’s policy states that it does not cover (that is, there is an exemption) “molds.” Is the artillery fungus a mold? A: This is another difficult question, and one that lawyers like to argue. Mold is generally thought of as being a superficial, fuzzy fungus growing on damp or decaying organic matter. Like that fuzzy stuff on old “moldy” bread or on an old orange. The artillery fungus does exhibit such growth during part of its life cycle, when living in damp mulch, and therefore is (at least at times) a “mold” during part of its life cycle. Q25: What is a biological definition of a mold? A: Biologically, the term "mold" has been used to generally describe a wide variety of different organisms such as slime molds, sooty mold, pink mold, blue mold in cheese, water molds, etc. These terms may be found in most modern, scientific textbooks or dictionaries dealing with “Mycology” (the study of fungi). This general biological usage makes the term mold very inclusive; under such a general usage, therefore, molds include many types of organisms, such as the artillery fungus, at least during part of their life cycle. Q26: But the actual spores stuck to the side of my house are not molds, are they? If not, then does my insurance policy include them? A: The spores on the side of your house are the reproductive structures of the fungus (although not biologically correct, think “seeds”). A good analogy is that they are shot like bullets from a gun. Just as the “bullets” are not the same as the “gun”, the “spore masses” on your house are not the same as a “mold”. Lawyers can put whatever spin they want on such terminology. And they do. Q27: Can you recommend a good lawyer who can solve my artillery fungus problem? Q28: But, this is America! Who can I sue? Who is responsible? Is the contractor that applied the mulch responsible? Is the person who made the mulch responsible? Is the store that sold me the mulch responsible? A: Since the artillery fungus can enter the chain of events at various places, I don’t see how anyone can be held responsible, unless they willingly supplied mulch with known artillery fungus in it. Which, of course, no good businessman would do! In my opinion, it is nearly impossible to prove where the artillery fungus entered the chain of events. This again is a subject for the lawyers. Q29: So, what is the final, ultimate solution to my problem??? A: Take out all of the infested mulch (usually just around the foundation - not out in the yard), bag it in a biodegradable bag, and take it to a landfill. Then put down a layer of landscape cloth or black plastic, and overlay it with stone or an artificial (non-organic) mulch. Q30: But, I don’t like stone - it’s so cold! I want to stay organic, and, like, use, like some sort of wood/bark mulch. Yet I can’t stand the artillery fungus. It’s driving me bonkers! What should I do? I’m at my wit’s end! A: Well, then, you may have to learn to live with the problem. That is, you cannot beat the artillery fungus (at this time), so try to manage it. Use mulches that the artillery fungus doesn’t like, such as large pine bark nuggets. Then, put down a fresh layer of mulch each year – we have no evidence for this, but yearly applications of layers of mulch appears to inhibit the artillery fungus. Another possibility, but one we haven not investigated, is to use ground cover such as ivy, periwinkle, or pachysandra in place of the mulch around your foundation. It seems likely that the artillery fungus would not grow well under the canopy (on the fallen dead leaves) of such ground-cover plants. Or, establish lawn right up to your foundation. An artificial mulch made of plastic, old tires, etc. should work, since only artillery fungi only grow on organic material, but we have not tested it. A third possibility, which I discussed earlier, is to blend 40% mushroom compost into your landscape mulch. Q31: OK, I am going to remove my old, infested mulch. But, what do I do with it? Q32: Do you ever get suggestions regarding removal of the spores from surfaces like cars or houses, and have you ever tried any of them? A: Yes, I have received many suggestions regarding removal of spores from cars or houses. I have not tried any of them. I have listed a few suggestions from readers below, but I emphasize that these have not been tested are not my recommendations.